This section consists of 1000 veteran burial plots surrounded by family plots on three sides. It appears that the veteran records were not updated after about 1975. Notes Govt. marker ordered Aug. 15, 1939. Notes Govt. stone ordered 11/16/39. Notes Govt. marker applied for July 17, 1939. Notes Body returned from overseas; Interment: Sat., June 8, 1948. Died Dec. 29, 1939 at Washington, DC aged 21 yrs. Notes Govt. 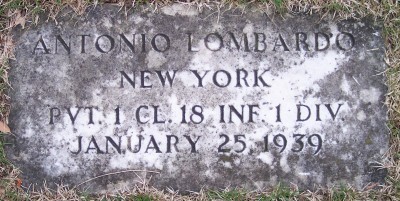 headstone ordered Feb. 8, 1940. Notes Body returned from overseas; Interment: Fri., July 9, 1948. Notes Also known as Louis Mathews. Govt. stone ordered May 26, 1939. Died May 24, 1940 at Vet. Adm. Fac., Batavia, NY aged 51 yrs. Notes No marker as of May 22, 1954. Died May 18, 1940 at Rochester, NY aged 43 yrs. Unit 13th Battery, U.S. Field Arty. Unit Btry. A, 76th Field Arty., 3rd Div. Notes Govt. marker ordered 8/4/39. Name Miller, Joseph F., Jr.
Name Mills, Walter F., Jr.
Died Aug. 25, 1940 at Sunmount Veterans Hosp. Name Morey, Walter L., Jr.
Notes Govt. stone ordered Aug. 17, 1939. Notes Govt. marker ordered Sept. 14, 1939. Notes Served under Muscarelli, but was interred under Muscarella. Enlisted Aug. 17, 1906 Naval Recruiting Station, Boston, Mass. Name Norris, Joseph F., Sr.
Notes Body returned from overseas. Notes Govt. flat marker ordered July 25, 1939. Died May 24, 1940 at Rochester, NY aged 51 yrs. Notes Govt. marker ordered 11/13/39. Name Perry, Anthony W., Jr.
Name Quinn, Bernard J., Sr.